Many times, I have felt disillusioned in my own country and what comes to mind first is the referendum 2005. I had just arrived from an exciting training on anti-corruption and good governance in the USA and I really felt I had changed my mindset, I was thinking like a Kenyan after the 5 weeks experiential learning. I arrived back to Kenya in the middle of the Banana / Orange craze. First, I did not quite understand when friends sent me email asking ‘are you banana or orange?’ Immediately I landed, it was like being hit with some air balloon (never been hit by one anyway) but it was a stark reality that I was not ready to face. After the dreams I had this was not what I wanted to see. I was in desolation and for more than one month, I felt I was in my own world!! I actually felt physically sick and thought this was some jetlag but after one week, I knew otherwise. Nothing could lift my spirit as I found that the people close to me didn’t quite understand where I was coming from when I insisted I was neither orange or Banana. That I did not think we needed the referendum to go ahead as things were etc. Many even told me, that they knew my stand!! Before I spoke they knew which side I was going to vote (due to my second name!!!). My voter card took the advantage to disappear and since I had no intention of voting I made no effort to replace it. By the time I figured that I should spoil my vote rather than not vote it was too late... can I admit I have no regrets? I struggled to be positive about Kenya but it was very difficult. Fast forward, 2007 I went to work in South Sudan and this was a 3 months experience that I am not likely to forget. I did not know what it means to have been at war, and I saw dilapidation that I had never seen. What strikes me now is that whenever there was some insecurity threat, or curfew we ( my colleague Justa was a Tanzanian) reminded each other about our air tickets, passports etc just in case. We knew that if the worst came the UN would be in no position to evacuate every foreigner there but at least there was hope. 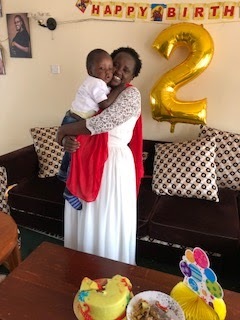 Two weeks after I came back to Kenya, excited to be back home, sweet peaceful home, the Post Elections Violence was here! It was a nightmare for everyone. I woke up every day imagining that this was the end of it all, but every day brought new fears. While talking to Justa (she stays in Kenya but had gone to Tanzania for holiday) as she sought information on what was happening she reminded me of precautions “remember to have your documents ready”. That was when reality struck me, “Where to? It doesn’t matter Justa, I have no where else to go this is home” I told her. After our telephone conversation I thought more about those words and I felt in despair, yes, this is Kenya, this is home, where else would I ran to? That is my inspiration, that I am the one to make a difference in Kenya. I am committed to the initiative ‘Kenyans Making a Difference’ (KMD) because this is my home, there is no short cut. I am convinced that I am part of the difference that Kenya needs. The difference that will make every girl and boy, lady and gent, man and woman say, I am proud of being a Kenyan. A Kenya where women and girls are not feeling like their bodies are the war zone, a Kenya where men and women will not be dying of hunger, where we are neighbors to each other. The more I share with other Kenyans the more certain I am that Kenyans are ready and willing to make a difference, problem is we do not put our efforts together. The simple things like being positive about one another, saying ‘hi’ when I am seated to other Kenyans (and I take Kenyan to mean anyone within the borders at now, whether as a citizen or a refugee), not running away from the beggars on the street, not looking for excuses not to do the best……..all simple little things, that add up. I now have a strong believe that I am making a difference wherever I am. I make a difference in my own small ways and if a mosquito can cause enough discomfort then what about me?